I created a couple of FREE printable Thanksgiving coloring pages for all of you to use with your kiddos! You can choose to have kids color a picture, paste images or write about what they are thankful for. When the printable is finished, frame or decoupage the finished page onto a canvas and display them in the house for Thanksgiving or give them as a gifts to family. They print out beautifully on bright white cardstock paper & would even look great painted using watercolors or watercolor pens. Feel free to download this freebie from my website or my TpT shop and please do not forget to leave me some sugar in the feedback section if you enjoyed this free gift! Use the links below the image to download this freebie. If you want to share this free gift, please make sure to always link back to this blog post and not as an instant download from your own blog or website. Thank you so much! I would LOVE to see what you all come up with if you use this with your kids! Leave a link to a blog post or send me an image at 3amteacher@gmail.com. 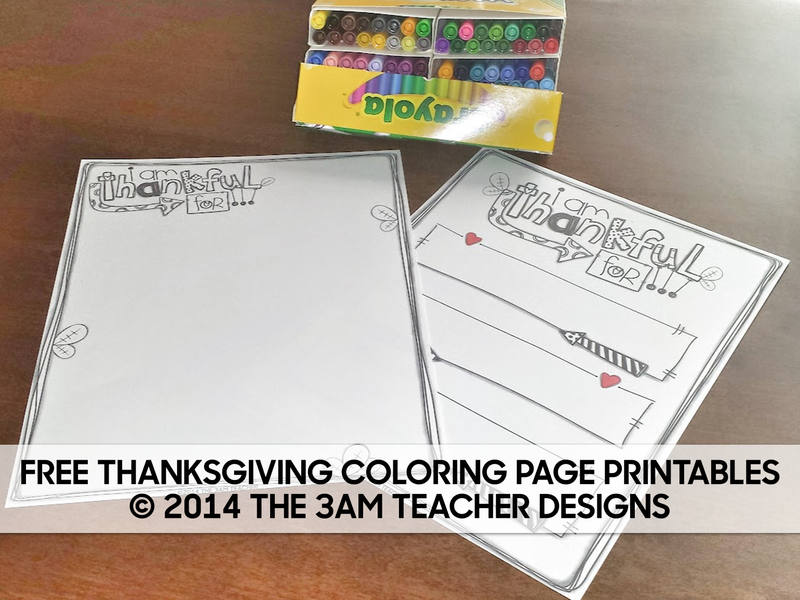 I can't wait to see your finished Thanksgiving printables & I hope you have fun using these! So cute! I love these! Thank you! will save for next Thanksgiving thank you!! !